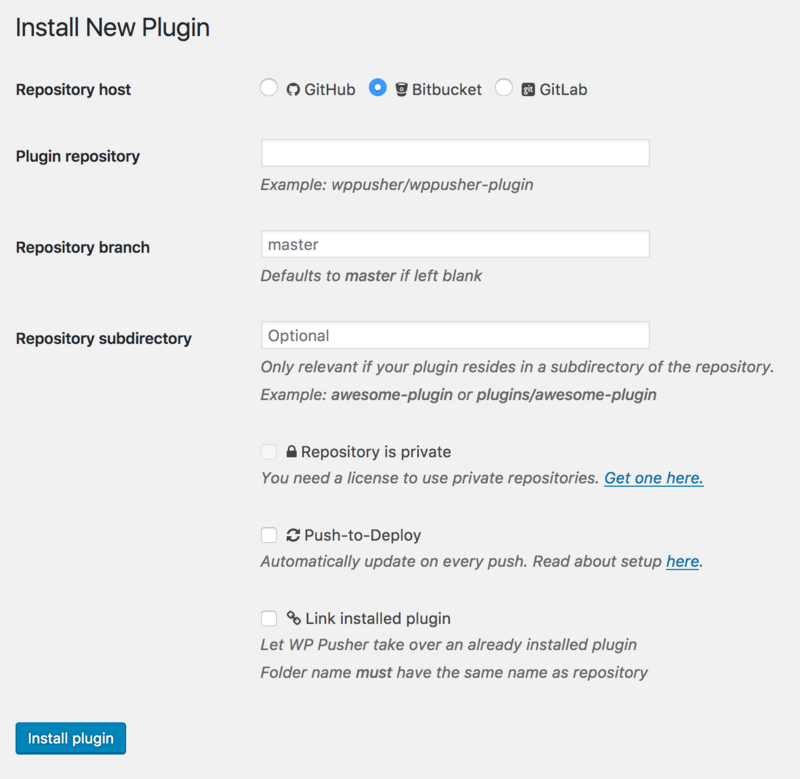 Installing a plugin or theme from Bitbucket is super easy with WP Pusher. In this guide you will learn about how to setup Bitbucket and how to install your first plugin or theme. If you want to install and manage a plugin or theme that is in a private repository on Bitbucket, you will need to obtain an access token for WP Pusher. You also need a token to enable Push-to-Deploy, no matter if your repository is public or private. In order to obtain a token, all you need to do is to navigate to the Bitbucket section of the WP Pusher settings screen, click "Obtain a Bitbucket token" and copy & paste the token into the text field. After clicking the "Save Bitbucket token" you can now install a private repository from Bitbucket. Repository host: Where the plugin/theme is hosted. Plugin/Theme repository: The repository handle, which is "username/repository-name". Repository branch: (Optional) Specify which branch you want to install your plugin/theme from. Defaults to master if left blank. Repository subdirectory: (Optional) If your plugin/theme lives in a subdirectory of the repository, you can specify the path here. Repository is private: Check this option if your plugin/theme is in a private repository. Requires a license and a Bitbucket token (see above). Push-to-Deploy: Check this option if you want WP Pusher to automatically update the plugin/theme every time you push new code. For Bitbucket, this is configured automatically by WP Pusher. Link installed plugin/theme: If the plugin/theme is already installed and you just want to connect it to WP Pusher, check this option. It is very important that the folder name of the plugin/theme on your web server is the same as the repository name. If you have any questions about WP Pusher, Git or WordPress, our email is hi@wppusher.com. Don't hesitate shooting us a message! You can also click the little ❤️ in the corner of this page.